Sweeping the roof last weekend to get ready for the rainy season, I saw this unusual view of the boatbuilding shed. Hard to imagine a 25-foot boat in there, huh? I ordered 15 gallons of MAS epoxy from Joel Mill at Devlin. With the 10% discount I got from ordering the plans from them earlier, the cost was about a third lower than System Three. I got a nice mix of fast and normal harderers and normal and thin resins, and a bunch of thickeners and cups and stuff. I don’t have any experience with MAS resins – I’m just going on the recommendations from Devlin. This plywood is odd – it has a twist and won’t lie flat without being clamped down. I’ve never had to deal with that before. I started scarphing the hull panels yesterday and expect to finish the process today. I power-plane them pretty close and clean them up with a belt sander. My Fein vacuum cleaner is set up to turn on automatically when the tools start up – it works great. I don’t need to wear dust protection. I’ve filled a whole large trash bag already with the shavings. Yesterday we got more than 1 1/2 inches of rain – a record for December 26. Since I started building the shed we’ve had unseasonably heavy snowfall, a record windstorm that knocked out our power for a record length of time, and the rainiest November in history. I’m expecting locusts any day. The plywood delivery guys from Edensaw just left, leaving a huge stack of beautiful plywood in the middle of the shop. They promised a morning delivery but finally showed up at 3:30 in the afternoon, but they were friendly and efficient and did all of the unloading themselves. This is 20 sheets of 12 mm Okoume for the hull, and 12 sheets of 18 mm Hydrotek for the bulkkheads. I’ll order the 6 mm bottom sheathing later – this was enough of a sticker shock – $2700. While waiting for the delivery I worked on the tent, making it more wind-proof and stopping some leaks. It’s in pretty good shape but I need a few warmer dry days to really finish it. The next step is to build the strongback and set up a scarphing assembly line. 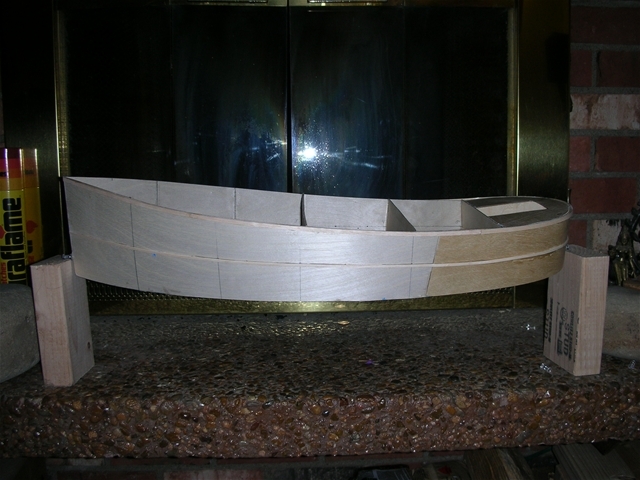 Then I can make the hull panels and the bulkheads and start putting it all together. I also need to order the epoxy and look for a dead refridgerator to keep it warm in. Idea: Devlin generally builds his hulls right-side up without molds, then adds some bulkheads and flips the hull upside downto finish it. Godzilla is different, I assume because of the round stern which needs a form to build it on. It’s built upside-down on bulkheads at each station. When I made my model I made all of the bulkheads full-height, that is, they went all the way to the sheer. Once I flipped it over I ended up cutting all of the bulkheads down to cockpit sole level because I have a walking surface almost all of the way around the boat. I’d hate to waste that much Hydrotek so I’m thinking of using Hydrotek for the part that will stay in the boat and cheap 3/4 inch ply as a form for for the upper part, or maybe even no bulkheads above the sole. 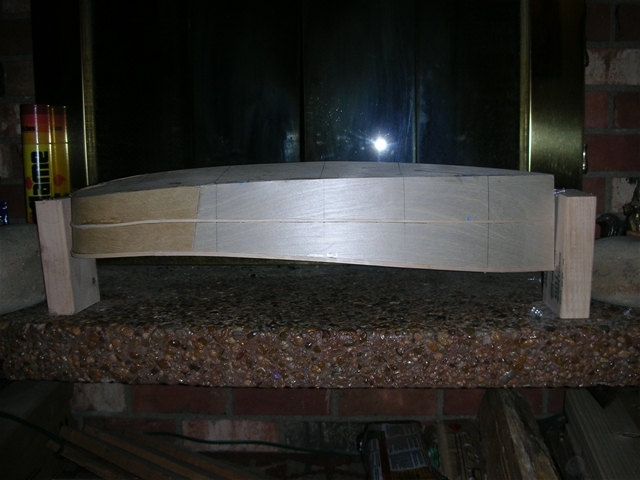 That way the upper hull panels will hang as I attach them to the hull bottom and assume the shape they want to be. The gunnels will give them their finished strength and shape. Spent the weekend erecting the shed. It towers over the back fence and glows like a big white UFO in the dark when I turn on the fluorescent shop lights. I have a few days of finishing work to do before it’s completely enclosed and ready to use. I extended the tent poles two feet in height, so the eve line is now 8′ off the ground, and the peak of the tent is about 13′ high. According to the model it should be high enough. 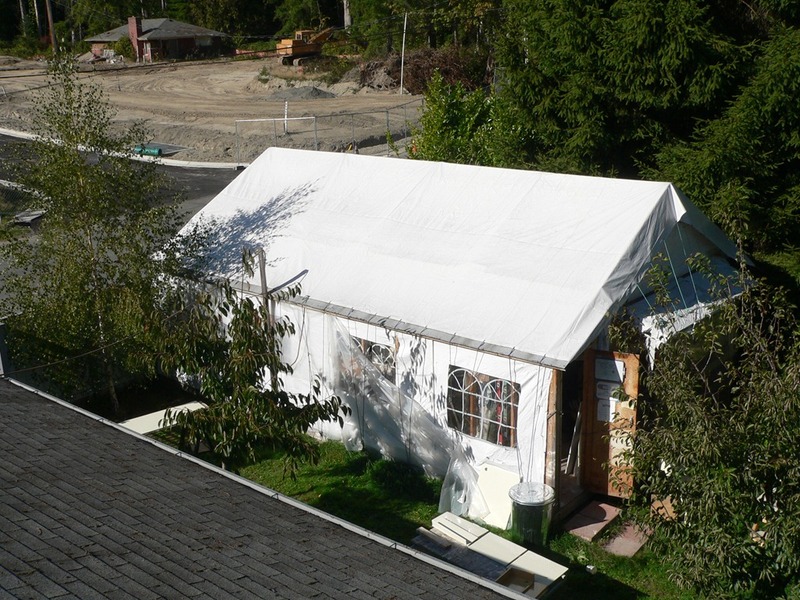 I extended the tent 3′ along the south side to act as a work area. It will hold the radial arm saw, a work bench, and a little office area to sit down with the drawings. And of course, the Moaning Chair. It poured rain all weekend. Last night when I was done working it was a great pleasure to sit inside and listen to the raindrops on the roof. 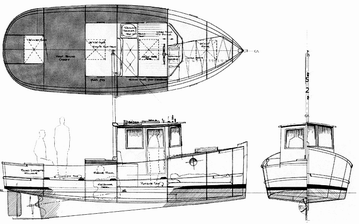 It’s a real relief to be finishing this initial step and to start thinking about actually building the boat. 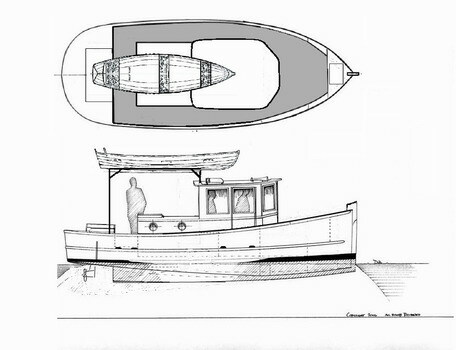 I hope to order the hull and bulkhead plywood and epoxy this week. Possibly start scarphing in December, a little earler than I scheduled. Update – Dec 12 – I stayed home from work today to finish this up. After hard rain for the past week today was relatively clear. Even some sunshine for a couple of hours! I got the plywood attached around the base, put on roll-roofing on the shed part, and made a door. It’s pretty well closed-in now and should be somewhat heatable. They say we’re getting more storms starting tonight, through the weekend. Idea – instead of making 8 sawhorses to lay out the plywood on to scarph, build the strongback early, with the crosspieces at the stations, but screw same-height uprights to the station pieces to act as sawhorses. After the panels are finished, use the uprights to attach the bulkheads. Saves time and materials, and I’ll feel better about spending the time levelling and squaring the thing knowing it will be used to build the boat on. The tent came in tonight, all except the poles, which UPS says will arrive soon. The frame looks good – reasonably strong – but the fabric looks very lightwight. McLendons has big white plastic tarps that look heavier. I may need to put one over the tent to make it hold up that long. Maybe it will add some insulation value also. One nice thing is that there are no cross-beams between the uprights so headroom will be better than I thought. We’ve had record cold and snow so I haven’t been able to do any work on the platform, even though I stayed home yesterday because the streets were too dangerous drive on. They say it will be warmer and dry this weekend so I hope to get the deck completed and the tent erected. 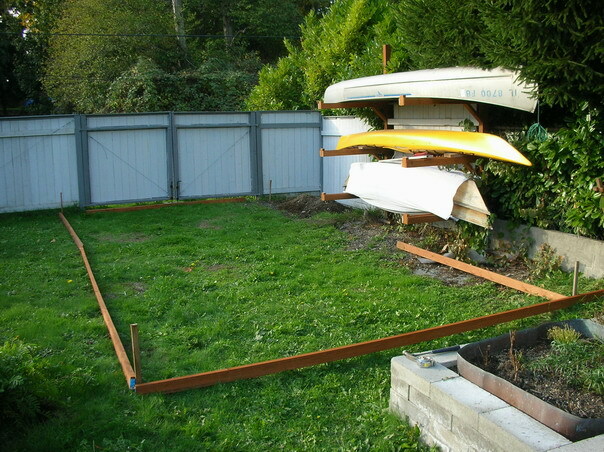 I started the boat shed yesterday. It’d going to be 16′ x 26′. The tent is 13′ x 26′ (actually 4 x 8 meters), so I need to decide what to do with the extra width. 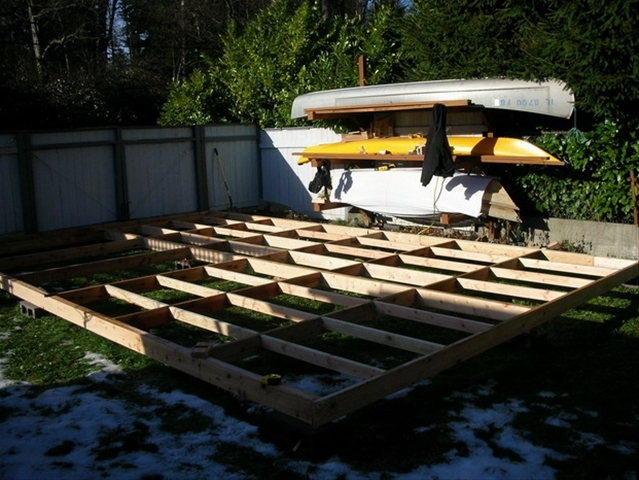 In the right-hand photo below, each opening is 4′ x 8′, and each one will have 3 cross-beams to support the decking. I’m using 3/4″ OSB for the decking because it’s 1/2 the price of plywood. I hope it’s strong enough. Those are double swinging doors on the fence that I added last year. 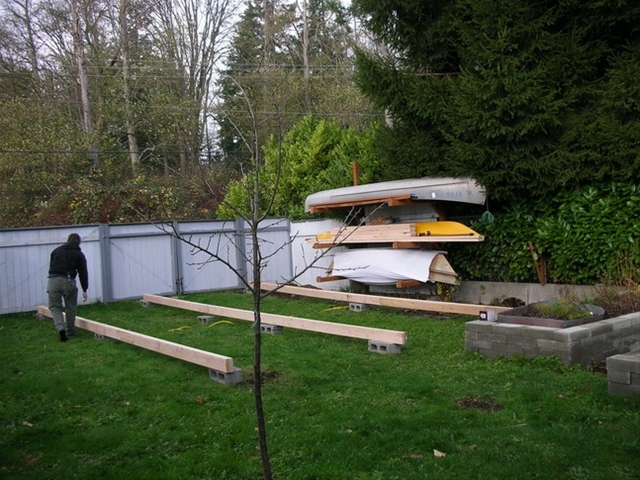 The opening width is 11′, so there should be plenty of room to drag the boat out on completion. Right now the deck is only approximately level. After I finish framing it in (but before decking) I’ll shim it to be level throughout using my new laser lavel. I’ll put some more cinder blocks under the places that will bear the most weight. The tent should get here this week. I’m anxious to see how it looks. I hope it’s solid enough to hold up through two winters. FInished the framing and leveled the whole thing with the laser level at dusk last night. I couldn’t see the laser line in the bright daylight. The tent poles were delayed because of the snow so I hope to get them tomorrow. I’m afraid to fasten down the decking before the tent arrives because I don’t want the OSB to get wet. I’ve got a dozen cinderblocks under the frame to support it. Home with a bad cold for the last few days, so I built a scale model of the Godzilla. It’s 1 inch: 1 foot, which is the same as the drawings. So I just laid the birch model plywood (1/16 bottom, 1/32 sides) under the drawings and pricked holes using a steel awl. Then connected the dots and cut out the parts. I used scissors for the thin stuff and an exacto knofe for the thicker parts. Blue tape for the stitching and thick instant glue to hold it together. It’s not a great model, but it’s square and to scale so I can use it to mock up the interior. The cardboard is the first mockup of the inside to help understand how the parts fit together. The little guy is 6′ 1″ tall. Bow. There will be a seat/chain locker just forward of the guy. Note the sideways bed with the raised footwell. The hole aft will be the outboard motor well. I haven’t designed the well yet. Shoebox construction! The pilothouse will have a sliding door on both sides. This is my most recent attempt. Dock to starboard against tall docks so you can step off the extended cabin top to the dock. 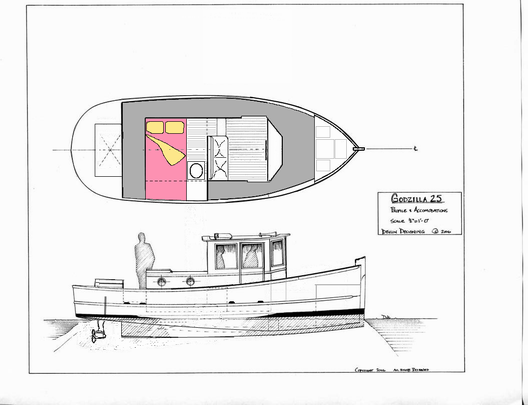 Lots of storage space in the bow for fenders and lines, as well as ground tackle. Good headroom over the main part of the bed. With a drain in the stern the dinghy can be stored upright, with rainwater draining out. This needs some sort of davit system to launch the dinghy, but it’s probably the best way to carry a large boat like this. I’m concerned about top-heaviness, so the dinghy should be lightweight. The gear (oars and pfd’s) can store right inside, so you can launch and go. This is the original design. I’m going to look into dropping to foredeck down a little and making it flatter so it’s easier and safer to walk on. 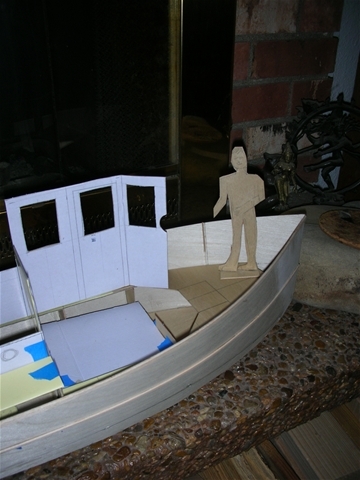 With the engine moved to the stern, the little aft cabin might be for the head and storage. It’s one thing to imagine a tent 13 x 26 feet, but marking it on the ground is a real eye-opener!